Dynatrac continues to lead the way in high ground clearance, severe-duty axle assemblies for the off-road enthusiast market. The all-new Dynatrac standard-cut, full-float ProRock XD60® is the strongest and lightest axle in its class. This axle is designed specifically for Jeep Wrangler and 4x4 builds using 37 to 40-inch-diameter tires. The ProRock XD60 fills a need between the current ProRock XD60 semi-float and ProRock 80™. The new Dynatrac ProRock XD60 starts with a highly engineered center-section cast from high-strength nodular iron. The patented ProRock® design provides the best ground clearance in the industry. The ProRock XD60 is 100 percent made in the USA. This newest Dynatrac center-section uses a standard-cut ring-and-pinion gear set, providing maximum strength for rear-axle applications on 4x4 vehicles with large tires. The axle tubes have also been strengthened, using 4-inch outside-diameter tubing with various wall thicknesses. This combination of a larger diameter without excessive tube-wall thickness provides incredible strength without adding unneeded weight, making the ProRock XD60 the strongest and lightest rear axle in its class. Additional strength is provided through the Dynatrac full-float design that includes 100 percent USA-made 35-spline floating shafts; 40-spline shafts are available as an option. The Dynatrac standard-cut, full-float ProRock XD60 is available with the same exclusive and revolutionary strength features of our ProRock XD60 high-pinion, reverse-cut axle introduced last year. Using CAD/FEA and advanced engineering tools, Dynatrac designed the new center-section for more rigidity, increasing the stability of critical tolerances during high stress for unmatched ring-and-pinion durability. 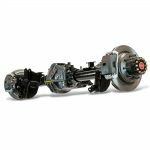 It is also available with oversized carrier and pinion bearings, providing a 50 percent load capacity increase over standard Dana 60 bearing sets. The ProRock XD60 is the only axle in its class specifically designed to support 40-spline chromoly axleshafts with a Dynatrac-exclusive 40-spline ARB Air Locker. This air locker is equipped with the industry’s first oversized carrier bearing trunnion, which will not deform nor cone-out under severe loads. Both 35- and 40-spline axleshaft and differential options are available in this same axle. This allows customers to upgrade to 40-spline shafts at a later time when their appetite for tougher trails increases with their skills and experience.